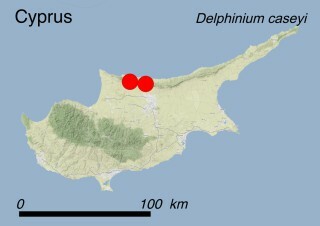 Delphinium caseyi is confined to the Pentadaktylos range where it has been recorded at two sites, one near St. Hilarion Castle, and the other at Kyparissovouno Peak. During the latest population census (2007), only 80 individuals were recorded: 50 individuals near St. Hilarion Castle, most of which were strongly affected by grazing, and 30 individuals at Kyparissovouno peak. This species prefers full sun and grows at the base of rocky cliffs or in the cracks of limestone boulders, in open phrygana and maquis, on mountain summits, between 800 and 950 m a.s.l (habitats 6.2: Inland cliffs. Rock pavements and outcrops, 6.4: Miscellaneous inland habitats with very sparse or no vegetation, 3.8.1: Maquis, arborescent matorral and thermo-Mediterranean brushes, and 3.8.3: Spiny Mediterranean heaths - phrygana, hedgehog-heats and related coastal cliff vegetation). Delphinium caseyi is an erect hairy perennial herb, which can reach 85 cm in height and has a thick rootstock. The basal leaves are palmately divided into 3-5 lobes, resembling a palm leaf, with a leaf stalk that can be up to 20 cm long. Leaves on the stem are smaller and have shorter stalks. In May or June, a long and thin stem shoots up from the base of the plant, supporting a dozen or more deep violet, long-spurred flowers forming dense inflorescences with hairy petals. The flowering period is from June to July. The plants may be propagated by seeds or asexually through woody rootstocks. All species of Delphinium are toxic, like the majority of the buttercup family. The long spur of the flower resembles the beak of a dolphin, the feature that inspired botanists to name the genus Delphinium. This species has been categorized CR (Critically Endangered) according to IUCN Red List Criteria C2a(i), because the number of mature individuals is less than 250, the population is projected to continue declining due to grazing and the lack of any protection measure. The number of mature individuals per subpopulation is <50. This species is probably one of the rarest endemic plants of Cyprus. The two known subpopulations cover less than 2 km2. The subpopulation at Kyparissovouno has suffered considerable damage from the set up of a huge telecommunication antenna on the peak at the end of the Seventies (threat 4.2: Utility and service lines). The whole population is threatened with grazing (threat 2.3.2: Small-holder grazing, ranching or farming) and gathering (threat 5.2.1: Gathering terrestrial plants - Intentional use), as its violet flowers make this species very attractive. There is also a potential threat to the subpopulations from nearby military activities (threat 6.2: War, civil unrest & military exercises). Furthermore, the species is threatened by stochastic environmental and demographic changes due to small population size (80 individuals are left) and localisation. What is being done to protect it ? Legally: This species is protected by the Bern Convention where it is listed in Appendix I, and by the 92/43/EC Habitats Directive where it is included as a priority species in Annexes II and IV. Moreover, it is included in the Red Data Book of the Flora of Cyprus as Critically Endangered. In situ: In the framework of the Life Project LIFE 04 NAT/CY/000013 ‘Conservation management in NATURA 2000 sites of Cyprus’, the Pentadaktylos mountain range, which hosts both existing Delphinium caseyi subpopulations, has been proposed to be included in the Natura 2000 Network as a Site of Community Importance (SCI). However, the site falls within the Turkish occupied area where the European Community acquis is currently suspended. Ex situ: A very small number of seeds coming from the subpopulation of St. Hilarion Castle are stored in the seed-bank of the Nature Conservation Unit of Frederick University of Nicosia. In situ: It is important to undertake research projects to monitor the population dynamics of this species and improve the knowledge on its biology (including seed ecophysiology) and ecology. Population reinforcement by using genetic material originating from both locations should be encouraged. Ex situ: More seeds should be collected and stored in seed banks. Additionally, the species should be conserved in selected botanical gardens. Dr. Marios Andreou, Nature Conservation Unit – Frederick University, Nicosia, Cyprus. Dr. Charalambos S. Christodoulou, Department of Forests, Ministry of Agriculture, Rural Development and Environment, Nicosia, Cyprus.